Camp Sawtooth has many opportunities to serve through volunteer service. Work Weekend is held every year on Memorial Day weekend. 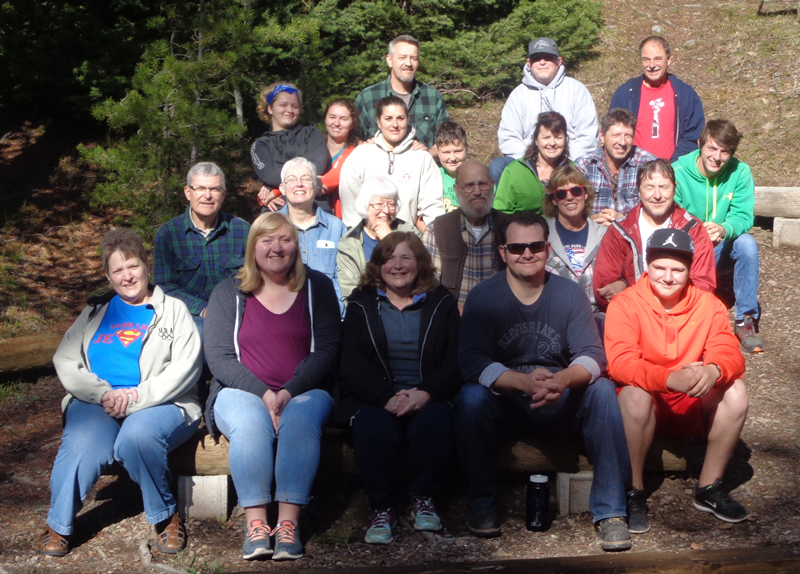 It is a time when the community of God comes together in fellowship and praise to prepare Camp Sawtooth for the camping season. All skill levels are needed to open, repair and prepare the camp after the long winter. Skilled and unskilled labor, young and old to help wash dishes and windows, sweep floors and chop wood, repair and prepare the plumbing and any winter damage. Housing and meals are provided. Camper space is also available. Click on the Work Weekend link for more info. During residential camps a Camp Host is needed to help with the daily operation of the camp. The Camp Host serves in weekly increments. The full job description and benefits can be accessed through the Camp Host link to the left. If you are interested in serving as a camp host during one of our residential camps please contact the Camp Director . Cabin Parents are needed to assist our program staff. As a Cabin Parent you will be assigned a cabin and assist one of our Program Staff in the care of 10 to 12 campers. If you are a parent of a child who attends camp you will receive a 50% discount for your child. Access the Cabin Parent job description & job application link to the left for full details. There is a limit of 3 male and 3 female Cabin Parents per camp so send your application early. Our Program Staff-In-Training program offers the opportunity for young adult campers to learn leadership responsibilities and to mentor younger campers. A PSIT will assist the Cabin Parent and the Program Staff in the Christian education of the Camp Sawtooth Campers. The PSIT fee is 50% of the tuition of the camp they will be attending. Access the PSIT job description & job application link to the left for full details. There is a limit of 3 male and 4 female PSITs per camp so send your application early. All of these forms are Adobe PDF files. If you do not have Adobe Acrobat Reader (or another program to read .pdf files) you can download Adobe Reader or click on the graphic below. If you have any other problems, please contact the Camp Directors by email.